The more local the beets the better for this super easy, healthy, and flavorful winter soup. Sauté a chopped onion and a couple minced garlic cloves in a soup pot with a bit of olive oil until the onion is translucent. 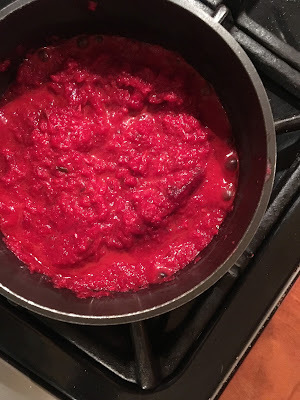 Add 1 ½ to 2 pounds of peeled beets cut into small chunks, a large can of crushed tomatoes along with their juices, and a quarter teaspoon each of cumin and cayenne pepper. Stir, then add enough water, chicken, or vegetable stock to cover the beets. Bring to a boil then simmer covered until the beets are soft, about an hour. It’s not necessary, but at this point you can use your stick blender or a food processor to puree the soup to your desired degree of chunkiness. Season with salt and some additional cumin and cayenne.